The bombings in the Moscow subway cannot provoke anything but horror and revulsion – and also pain, for those who have lost parents, siblings or loved ones. This feeling is one that is familiar to the tens of thousands of Chechens who have had family members taken away from them by the violence of the Russian state, though for what reason is another story. Many theories have been advanced, of which to me the most convincing one is the promotion to the Russian government of people who had no chance of rising to the top by any other means, and not the existence of any moral or other considerations. Let us consider the features of the strategy of extermination that is practiced in Chechnya. From a legal point of view, can the “conveyor belt of death” which operates in the republic be classified as a terrorist mechanism? This question is one that has led even human rights workers into perplexity. For the past ten or fifteen years they have lurched from one exculpatory term to another – from "excessive use of force" and "disproportionate violence" on the one hand to "counter-terrorist operation" on the other. In the spaces in between there has sometimes (even in the present instance!) gleamed an element of sense, particularly in relation to concepts like state terror and the existence of death squads, for example. The roaming of certain people about the republic’s forests in broad daylight is, I think, one reason for the continuing violence in the North Caucasus, though perhaps not the main one. This violence eventually produced its mirror image in Moscow, though one should be careful not to confuse cause with effect. Take, for example, the now distant events at Budyonnovsk in1995. Undoubtedly, the seizure of the local hospital there was an act of terror, no matter what anyone says. And the fact that during the seizure the hostage-takers put forward political demands – the withdrawal of troops from Chechnya, the beginning of political negotiations – only emphasizes the important point, leaving no room for a different interpretation: international law has not yet produced an exact definition of terrorism. It is, however, generally accepted that terrorism means violence or the threat of violence against civilians in order to obtain political, military or other advantages. Or something like that. It is therefore also possible to consider as a terrorist act the seizure of the emergency hospital in Grozny by soldiers of the 81st Samara Regiment, which happened six months before Basayev’s raid on Budyonnovsk. In both cases civilians were the object of attack. The seizing of hostages including women and children and their use as human shields is actually a common practice of the Russian military and special services, and it was worked out during the First Chechen War. Those who are in any doubt about this should refer to the Memorial Human Rights Centre report which bears the rather eloquent title Behind Civilians' Backs. In other words, the primary feature of a terrorist act is violence or the threat of violence (intimidation) directed against civilians. 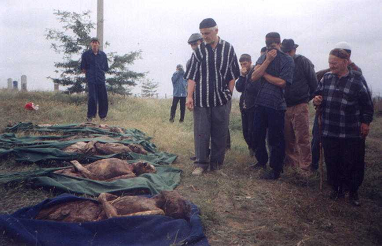 Murder, hostage-taking, torture and beatings are things of which the inhabitants of Chechnya have long experience, and these things are now gradually beginning to spread to the other populations of the North Caucasus. For some reason, however, no one is in any hurry to call the Russian security forces terrorists. This name is given to those who wear beards or the hijab, who pray to Allah and blow themselves up, taking other people with them. The techniques of a rather cartoonish propaganda have been used in an attempt to mask the essence of what is happening in Chechnya. And today many are satisfied with this. In a different world, the list of terrorists or terrorist suspects would not be so one-sided. It would also contain the names of those who have found comfortable posts at the top of the Russian government. I repeat: the hallmark of a terrorist act is violence directed against those who cannot defend themselves, and the securing of certain preferences by means of it. The methods of execution are not important, and neither are the numbers of people killed, whether by a tactical missile with an accuracy of one, two or five meters, or a "human bomb." Incidentally, if weapons of mass destruction are used, the effect achieved is one hundred percent. While a suicide bomber laden with a deadly charge must get to the object of the attack undetected, the rocket, detected or undetected, will still hit the spot where it was sent – as in the case of Grozny’s maternity hospital, mosque and central market in October 1999, when hundreds of people, including adults and newly-born infants were killed. At the time, all of Chechnya’s inhabitants experienced horror, fear, and numbness. It is far from my intention to justify the terrorists. I am not even trying to describe the genesis of terrorism in the North Caucasus. I merely think that if the Russian public had had the courage to call the military campaign in Chechnya by its rightful name – terror – it might have stopped the progression of the disease while still in its early stages.